Open to all 7th through 12th grade students in Solano County. 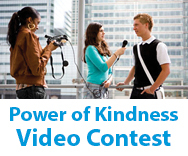 Submit a video between 30 seconds and two minutes in length that expresses what the power of kindness can accomplish in your community. Click HERE for details. If you've ever considered becoming a volunteer, now is the time. Search hundreds of volunteer opportunities right here in Solano County. We'll help you find the right program so you can start making a difference today. SOLANO COUNTY – The Solano County District Attorney, together with the Solano County Family Justice Center and the Solano Children's Alliance, invite the public to participate in Children’s Memorial Flag Day on Friday, April 26 from noon – 1 p.m. in front of the Solano County Health and Social Services building, 275 Beck Ave., Fairfield to honor children who have been lost to violence. SOLANO COUNTY – The Solano County Department of Health and Social Services, Behavioral Health division, invites everyone to join them at the fifth annual Mental Health Awareness Month Celebration on Saturday, May 4 at the County Events Center, located at 601 Texas Street in Fairfield. SOLANO COUNTY – First 5 Solano has released a request for applications for annual grants with up to $20,000 per grant available to address the needs of children ages zero to five, their parents/caregivers, and/or providers of services to children ages zero to five in Solano County.